“Tucker” comes to us with over 25 years of playing and coaching experience. His tennis career began by accident. At age 13, he was a competitive swimmer, but when he attended a summer 4-H camp, all the swimming classes were full. Tennis was empty, he signed up, fell in love, and never looked back. He was as a multi-sport athlete in high school, where his tennis team regularly contended for the Virginia state title. He was awarded the Coach’s Award for tennis in his senior year. He began teaching in 1992 as an Instructor for the Upward Bound program at Coppin State College in Baltimore, MD. Later, he taught at the Yale Junior Tennis Camp (aka Blue & White Championship Tennis Camp) for 14 years, working with kids from ages 5-18. 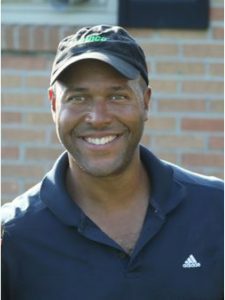 While working on his Ph.D. in Philosophy and Religious Studies, he served as an Assistant Coach/Head JV Coach for the Yale Women’s tennis team from 1999-2001. He is also a certified personal trainer who enjoys working with players of all ages and skill levels and is committed to helping them reach their fullest potential.